In an intimate, lounge-like setting, Bell & Ross in Burlington Arcade invites you to view their exclusive range of luxury watches. The French company combines the best of Swiss watchmaking, where all its models are made, with military precision. 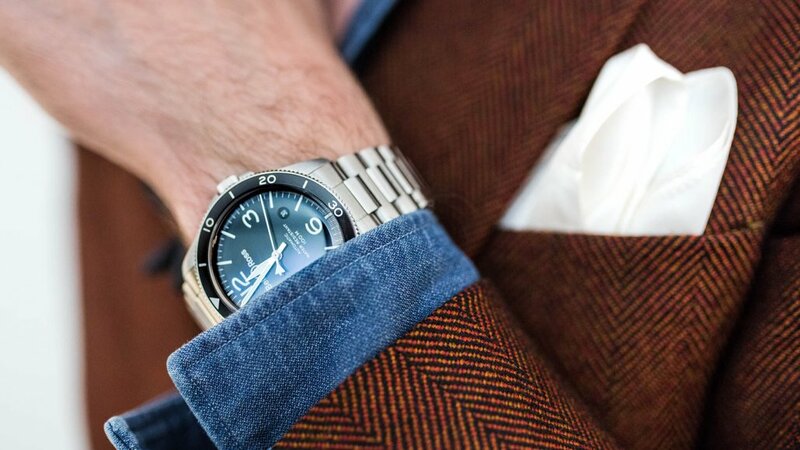 Designed for professional use in extreme circumstances, such as aviation, space exploration, and diving, you can guarantee their watches are of the highest standard. Every piece is built upon their four key principles: legibility, functionality, reliability, and precision. 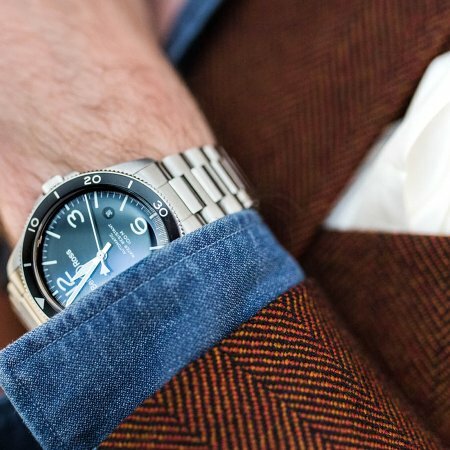 A long history of partnering with the military has resulted in a variety of top end, utilitarian timepieces, and their continued innovation has earnt them much acclaim, including holding the world record for water resistance with their HYDROMAX 11 100M. This unique selling point is highly visible in the boutique, which is decorated with pictures, books, and models of the aircraft and pilots who inspire their work. The mid-century modern furniture sets a masculine tone amongst streaked marble that could pass as a terrain map from a cockpit. They create styles for women as well as men and come in three key collections; the ‘Vintage’ collection, a revival of the brand’s origins making timepieces for pilots in the 1920s, the ‘Marine’ collection, made in partnership with the French navy, and the ‘Instruments’ collection. They also sell a number of accessories including replaceable straps and clasps, watch cases, tools, and card holders. Every watch comes with a two-year international warranty for quality assurance. To ensure it lasts even longer, a range of services are also available from the boutique including battery replacement, polishing, general maintenance and full servicing which is recommended every four years. Private appointments are available at the Burlington Arcade boutique, the only Bell & Ross store in the UK. Take your time in choosing the perfect timepiece over light refreshments with a sales consultant who will present the collections to you. If you make a purchase on the day, you’ll receive an additional strap for your watch free of charge.